"The detector showed HIGH readings in my house from the smoke detectors!" "Very excited to find this combo on the site - not sure if it's available anywhere else! Always nice to save some money. Thank you!" "No storage case is my only complaint. Otherwise, superb device." "Although the Ecotester is larger than the Impulse, both are quite light and compact and can be easily carried around throughout the day. I was especially impressed with how fast both devices began to take measurements and give readings. A detector I had in the past took so long every time, so this was refreshing." "I bought this for my father and wasn't sure if he was gonna like it, but he ended up loving it and tells me its the best gift I've ever gotten him, and I know its true because he never stops talking about it. lol"
This device helped decrease my husband's migraines! "I've been doing a great deal of research on EMF's and I couldn't wait to get my Impulse in the mail. First, I could not believe how quickly it arrived after I placed my order. Then, I was so happy to discover that it worked just as I had hoped. I was planning to use the Impulse to measure items and areas in my house and make a few small changes, but once I got going, I ended up rearranging almost the entire house! My husband wasn't really on board at first, but then he realized that it actually made a difference, especially after we moved our alarm clock away from the head of the bed. He suffers from severe migraines and he's noticed that they've drastically decreased since then. 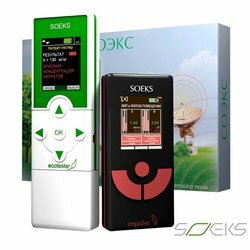 We highly recommend the SOEKS Impulse; it's helped us incredibly!" "I wish there have been more products to choose from. But works good." "the soeks usa website is very sleek and sophisticated and very easy to navigate"
"The BLOG is my favorite. Great articles about emfs, radiation, and their risks. Very easy and fun to read, and very helpful information." "The service was prompt and thorough. Very Good company to work with."